While swimming is great for fitness, it can also be a very peaceful exercise. Being in the water is quiet, smooth and rhythmical. You can experience a great exercise session that also feels like a meditation. You don't have to be an Olympian to enjoy the benefits of swimming. It is an effective way to improve and maintain your fitness and health regardless of your age or fitness level. Fitness legend Jack LaLanne is one of the most notable examples of the impact of swimming on health and longevity. Swimming was an important part of both his daily fitness routine as well as the way he would test his fitness limits throughout his life. He lived to 96. Swimmers of all ages have a lower risk for developing cardiovascular disease, according to a study by the Counsilman Center for the Science of Swimming Human Performance Laboratory at Indiana University. The benefits of swimming laps are numerous. The exercise is rhythmic and can be done for longer durations. 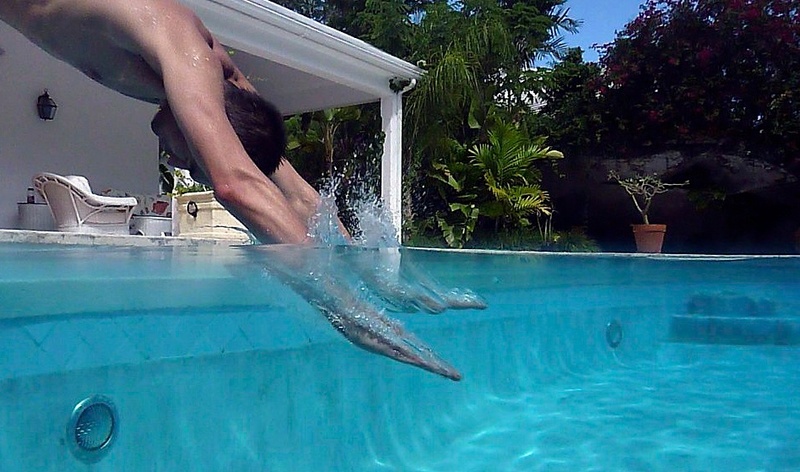 Even though it does not involve weights, the resistance against the water provides a significant training benefit. Improvements in skeletal muscle mass equaling improvements in strength, muscle tone, and power. The water can be a great way to train if you have various orthopedic issues such as a bad knee or back. If you have a hard time carrying your body weight due to an injury, your buoyancy in the water can help you to exercise with less pain while at the same time improving your range of motion. A heated or therapeutic pool can be of tremendous comfort for people with arthritis or various bone, joint, and muscular conditions. Don't let fear of the water or your current inability to swim stop you! If you need a confidence boost, take a few lessons. Learn proper and efficient swimming technique. Improving your technique will make your exercise more effective and also less stressful. Seek out a swim coach or take a class that meets your needs. Don't let go of your traditional exercise routine. Continue to include strength training, flexibility and cardio along with your swimming routine, as all will benefit. Monitor your heart rate and overall intensity as you would with land-based cardio. Heart rate monitors can be a quick and easy way to check your pulse in the pool. Keep swimming fun! Participate in swim events, many of which are age-based and non-competitive (only competing against yourself). You may look to incorporate swimming as a seasonal exercise. In areas where the weather gets cold, swimming might be a great exercise to save for the summer (unless you have access to an indoor pool). Our goals for swimming should mirror our goals for land-based fitness. Monitoring both time and intensity to meet traditional exercise guidelines is important. If you add swimming, remember to include it in your goal of 180 minutes per week of cardiovascular exercise. The research from IUB found that people who swim 3,500 to 5,000 yards (roughly 2 to 3 miles) three to five times a week can postpone the aging process for not just years, but for decades! As with all exercise, it's never too late to begin to "test the waters" with a new form of exercise. What benefits have you found from incorporating swimming into your fitness program? Have questions regarding transforming your way of eating and living, "Ask Dr. Ornish!"